that can be vaporized without decomposition. Typical uses of GC include identification, quantitation, separation (of a mixture of different components and determination of the relative amounts of such components). In preparative chromatography, GC can be used to prepare pure compounds from a mixture.In gas chromatography, the mobile phase (or “moving phase”) is a carrier gas, usually an inert gas such as helium or an unreactive gas such as nitrogen. The stationary phase is a microscopic layer of liquid or polymer on an inert solid support, inside a piece of glass or metal tubing called a column. Hence the full name of the procedure is “Gas–liquid chromatography”, referring to the mobile and stationary phases respectively. The instrument used to perform gas chromatography is called a gas chromatograph. The gaseous compounds being analyzed are carried by mobile phase and interact with the stationary phase in the column. The interaction time is specific for each compound. This causes each compound to elute at a specific time, known as the retention time of the compound. The comparison of retention times is what gives GC its analytical usefulness.Gas chromatography is similar to other chromatography techniques in principle, but has several notable differences. The column through which the gas phase passes is located in an oven where the temperature of the gas is controlled. Gas chromatography is also sometimes known as vapor-phase chromatography(VPC), or gas–liquid partition chromatography (GLPC). A Brief History of GC Chromatography dates to 1903 in the work of the Russian scientist, Mikhail Semenovich Tswett. German graduate student Fritz Prior developed solid state gas chromatography in 1947. Archer John Porter Martin, who was awarded the Nobel Prize for his work in developing liquid–liquid (1941) and paper (1944) chromatography, laid the foundation for the development of gas chromatography and he later produced liquid-gas chromatography (1950). various chemical and physical properties andtheir interaction with a specific column filling, called the stationary phase. As the chemicals exit the end of the column, they are detected and identified electronically. The function of the stationary phase in the column is to separate different components, causing each one to exit the column at a different time (retention time). Other parameters that can be used to alter the order or time of retention are the carrier gas flow rate, column length and the temperature. Aknown volume of gaseous or liquid analyte is injected into the “entrance” (head) of the column, usually using a micro syringe. As the carrier gas sweeps the analyte molecules through the column, this motion is inhibited by the adsorption of the analyte molecules either onto the column walls or onto packing materials in the column. The rate at which the molecules progress along the column depends on the strength of adsorption, which in turn depends on the type of molecule and on the stationary phase materials. Since each type of molecule has a different rate of progression, the various components of the analyte mixture are separated as they progress along the column and reach the end of the column at different times (retention time). Adetector is used to monitor the outlet stream from the column; thus, the time at which each component reaches the outlet and the amount of that component can be determined. Generally, substances are identified (qualitatively) by the order in which they emerge (elute) from the column and by the retention time of the analyte in the column. argon is used as the mobile phase carrier gas. The carrier gas passes between two electrodes placed at the end of the column, and adjacent to the anode (negative electrode) resides a radioactive foil such as 63Ni. The radioactive foil emits a beta particle (electron) which collides with and ionizes the carrier gas to generate more ions resulting in a current. When analyte molecules with electronegative / withdrawing elements or functional groups capture the electrons, there is a decrease in current generating a detector response. Flame photometric detector (FPD), which uses a photomultiplier tube to detect spectral lines of the compounds as they are burned in a flame. Compounds eluting off the column are carried into a hydrogen fueled flame which excites specific elements in the molecules, and the excited elements (P, S, Halogens and some metals) emit light of specific characteristic wavelengths. The emitted light is filtered and detected by a photomultiplier tube. In particular, phosphorus emission is around 510-536nm and sulfur emission at 394nm. 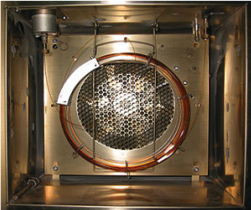 Atomic Emission Detector (AED), a sample eluting from a column enters a chamber which is energized by microwaves that induce plasma. The plasma causes the analyte sample to decompose and certain elements generate atomic emission spectra. The atomic emission spectra is diffracted by a diffraction gradient and detected by a series of photomultiplier tubes. Nitrogen–phosphorus detector (NPD), a form of thermionic detector where nitrogen and phosphorus alter the work function on a specially coated bead and a resulting current is measured. Mass spectrometer (MS) – also called (GC-MS) highly effective and sensitive, even at small quantities of sample. Gas chromatographs are connected to a mass spectrometer which acts as the detector. 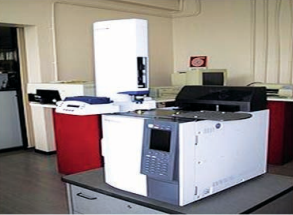 The combination is known as GC-MS. Gas chromatographs are connected to a mass spectrometer which acts as the detector. The combination is known as GC-MS. NMR. When GC-MS-NMR is connected to an infrared spectrophotometer which acts as a backup detector, the combination is known as GC-MS-NMR-IR. It must, however, be stressed that this combination is very rare as most of the analyses are concluded via GC alone. The methodis the collection of conditions in which the GC operates for a given analysis. Method developmentis the process of determining what conditions are adequate and/or ideal for the analysis required. The variable conditions required for the analysis include inlet temperature, detector temperature, column temperature (isothermal/temperature program), carrier gas and carrier gas flow rates, the column’s stationary phase, diameter and length, inlet type, sample size and injection technique etc. Typical carrier gases include helium, nitrogen, argon and hydrogen etc. Carrier gas selection depends on the type of the detector being used, for example, DID requires helium as the carrier gas. In the case of gas samples, however, the carrier is sometimes selected based on the sample’s matrix, for example, when analyzing a mixture in argon, an argon carrier is preferred, because the argon in the sample does not show up on the chromatogram. Safety and availability are also considered in carrier gas selection, for example, hydrogen is flammable, and high-purity helium is difficult to obtain in some areas of the world. As helium is scarce, hydrogen is often being substituted for helium as a carrier gas in several applications. The purity of the carrier gas to be used is also usually based on the type of the detector, though the level of sensitivity needed plays a significant role. Typically, gases of purity 99.995% or higher are used. system; adsorbed samples (e.g., on adsorbent tubes) are introduced using either an external (on-line or off-line) desorption apparatus such as a purge-and-trap system, or are desorbed in the injector (SPME applications). The choice of column depends on the sample and the active measured. The main chemical attribute regarded when choosing a column is the polarity of the mixture, but functional groups may play a significant role in column selection. The polarity of the sample must closely match the polarity of the column stationary phase to increase resolution and separation while reducing run time. The separation and run time also depends on the film thickness (of the stationary phase), the column diameter and the column length. precisely controlled electronically. The rate at which a sample passes through the column is directly proportional to the temperature of the column. 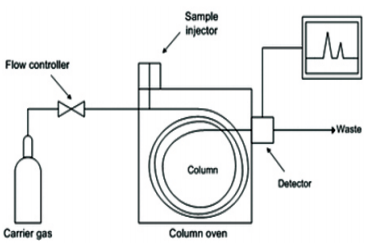 The higher the column temperature, the faster the sample moves through the column. However, the faster a sample moves through the column, the less it interacts with the stationary phase, and the less the analytes are separated. In general, the column temperature is selected to compromise between the length of the analysis and the level of separation. A method which holds the column at the same temperature for the entire analysis is called “isothermal.” When the temperature of the column is varied (not same throughout the analysis), then the condition is called “temperature program”. Atemperature program allows analytes that elute early in the analysis to separate adequately, while shortening the time it takes for late-eluting analytes to pass through the column. Generally chromatographic data is presented as a graph of detector response (y-axis) against retention time (x-axis), which is called a chromatogram. This provides a spectrum of peaks for a sample representing the analytes present in a sample eluting from the column at different times. Retention time can be used to identify analytes if the method conditions are specific and constant. Also, the pattern of peaks will be constant for a sample under constant conditions. In most modern applications however the GC is connected to a mass spectrometer or similar detector that is capable of identifying the analytes represented by the peaks. The area under a peak in the chromatogram is proportional to the amount of analyte. By calculating the area of the peak using the mathematical function of integration, the concentration of an analyte in the original sample can be determined. Concentration can be calculated using a calibration curve created by finding the response for a series of known concentrations of analyte, or by determining the relative response factor of an analyte. The relative response factor is the expected ratio of an analyte to an internal standard (or external standard) and is calculated by finding the response of a known amount of analyte and a constant amount of internal standard (a chemical added to the sample at a constant concentration, with a distinct retention time to that of the analyte). In modern systems, computer software is used to draw and integrate peaks, and match MS spectra to library spectra (in case of MS). toxic substances in soil, air or water. GC is very accurate in determination if used properly and can measure picomoles of a substance in minute volumes of liquid sample, or parts-per-billion concentrations in gaseous samples. GC is used widely in applications involving food analysis. Typical applications pertain to the quantitative and/or qualitative analysis of food composition, natural products, food additives, flavor and aroma components, such as pesticides, fumigants, environmental pollutants, natural toxins, veterinary drugs, and packing materials. At Konark Research Foundation, we have Gas Chromatographs with a variety of detectors including MS that can be used in the analysis of APIs, agro chemicals, raw materials, intermediates, residual solvents, impurities etc.